Here we see a really nice and effective way to install the GO5 Compact GPS unit into a Big Rig Tractor Trailer with the use of our plug in cable for heavy vehicles. 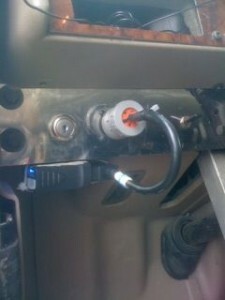 With a tie wrap and the 9 pin connection cable, as you can see plugged here into the dash of this truck. We had this big rig up and tracking in a matter of minutes. Thanks to everyone over at Abbotsford Ability Moving & Storage for choosing GPS to GO. Want to see more industry examples of fleet tracking for trucks? Read our fleet tracking reviews.